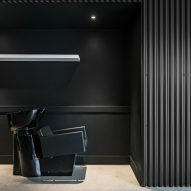 This black and white space in Toronto by local firm StudioAC offers coffee in the front and haircuts in the back. 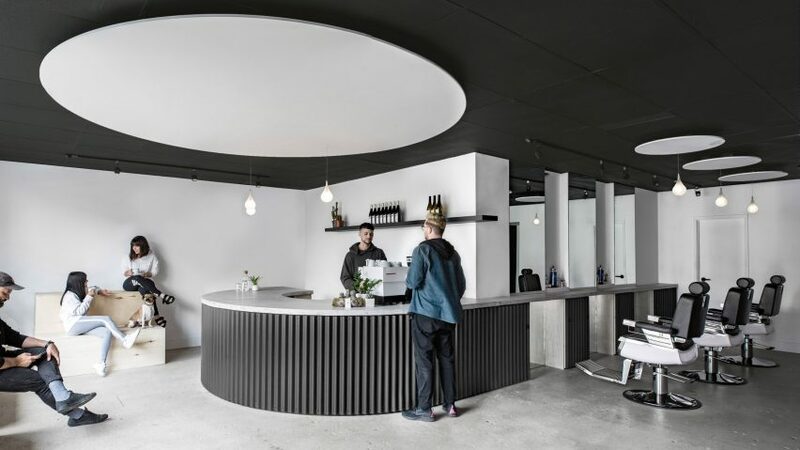 Juice barbershop and cafe is located in the city's West End neighbourhood, and is characterised by its minimal industrial interior. 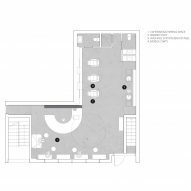 Based in the city, StudioAC designed the 800-square-foot (74-square-metre) space around functionality and flexibility. 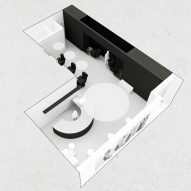 The small multi-purpose shop has an L-shaped floor plan, with a cafe at the front portion and hair salon in the rear. "Juice was an experiment in creating a memorable and new type of commercial space with limited resources," said the studio. Fronted by a large expanse of glazing, the cafe portion is flooded with natural light in the daytime. Overhead are a series of large white circles installed across the otherwise dark ceiling, continuing to brighten the space. 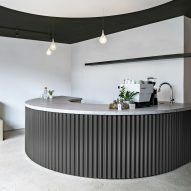 A curved counter wrapped in black corrugated metal and topped with concrete top is the focal point of the project. This element serves as the cafe counter, and extends to the rear where it acts as a ledge for barber stations. 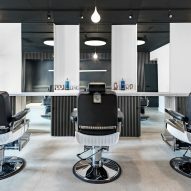 Three corrugated metal salon carts are able to tuck into its base, each accompanying a floor-length mirror and black-and-chrome barber chairs for coiffed customers. The chairs can be moved to a nook for washing hair on the other side of the space, which is coloured entirely black. "The theatrics of transforming the space from one programme to the other is celebrated through concealing various loose components when not in use," StudioAC said. Flexibility is also provided by modular plywood benches at the front of the cafe, which can be moved around and organised for various functions. Two bathrooms are provided in the rear. StudioAC has also recently designed the Annex hotel in Toronto's East Side, using custom plywood furniture. 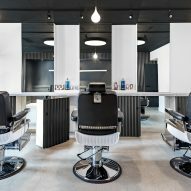 Minimal interiors are a popular choice for salons, with other examples found in Montreal and Guadalajara. Photography is by Andrew Snow.